ARTSIDA is an annual art exhibition and benefit auction presented by AIDS Community Care Montreal (ACCM). This year's event raised $60,000 for programs and services offered by ACCM, which provides essential services for Montrealers living with HIV/AIDS. Allan y Jonathan by Pierre Dalpé. The exhibition of selected pieces ran from March 23 to April 6 at Galerie Dentaire. On April 7, the artwork was moved to the Musée d’art contemporain de Montreal for the auction. The auction was followed by a party in the Main Hall of the museum, where auction-goers and the general public danced the night away. In the fall, the organizers appealed to artists everywhere for submissions to the fourth edition of the annual ARTSIDA exhibit and auction, formerly known as Project Hope. Over 50 artists were selected to take part in this year’s event. Among them were seven talented people with ties to Concordia University, whose works sold for between $400 and $1,000 each. Evergon, also known as Celluloso Evergonni, Eve R. Gonzales or Egon Brut, is the studio arts undergraduate program director as well as an associate professor of photography at Concordia. He also works as an artist/photographer portraying primarily, but not solely, gay male culture. His piece in this year’s ARTSIDA exhibit, called Tom, is part of Evergon’s Chez Moi series of photos, which deals with topics such as memory, eroticism and intimacy. Daniel Barkley holds a BFA and an MFA in film production from Concordia University. He is a figurative painter who draws inspiration from biblical and mythological stories found in art history. For Barkley, ARTSIDA holds a special significance. “I was a student when HIV/AIDS first appeared,” says Barkley. “When I was in my mid-twenties, I was going to funerals for kids my age. AIDS Community Care Montreal does amazing work with people who are living with AIDS, and has great educational programs.” This is Barkley's fourth year participating in the ARTSIDA show. 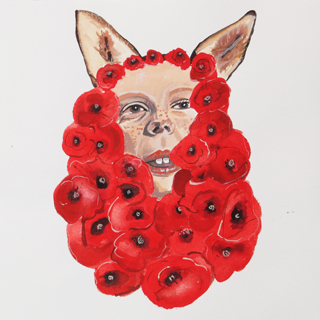 Poppy Boy by Jessica MacCormack. Vincent Chevalier graduated last year from Concordia with a BFA in intermedia/cyberarts. His work deals with disclosure and its effects. His performances, videos, photographs, web art and installations underline an intimate distance between his art works and the viewer. Johnny Forever graduated with a Master's in Art History from Concordia last fall. He is a Polish-born, genderqueer performance and installation artist currently based in Montreal. Forever’s work “weaves surrealist narrative through the use of song, fibres, video, gesture, illustration and drag. They explore love, loss, and longing with a particular investment in these themes as a part of radical queer and trans cultural production.” Forever’s art and performances have graced cabaret stages, theatre spaces, and galleries in Montreal, Warsaw, Toronto, and Berlin. Adam Simms is a Montreal-based photographer. He recently completed a Bachelor of Fine Arts with a major in Design Art and a minor in Photography at Concordia University. His native Newfoundland is often the subject of his contemporary landscape work.